It’s no secret that China’s beauty market has experienced phenomenal growth for a number of years - in fact, China has become the fastest growing beauty market in the world over the last decade. Prestige beauty is particularly strong, with NPD Group reporting a market growth of 21% in 2011 alone. So naturally, China is now very much in the sights of many UK beauty companies wanting to capitalise on a whole new - very lucrative - market. However, entering the Chinese beauty market comes at a price, because Chinese law states that before any beauty products can be marketed in China, the country may require the products to be tested for safety in China’s own laboratories… on animals. While this may not be an issue for some beauty companies, for any brand that bases its identity and ethos on being animal-friendly, it basically makes China a no-go area unless it manages to get granted exemption from animal testing. “Do we like China’s policies? No…and that is really the point. Going into China was a huge decision for Urban Decay. But, we believe that change cannot and will not happen by outside pressure alone in a closed market. Change can only happen from within. When we enter the Chinese market, we will do our part to help make those changes. Furthermore, the BUAV has just announced that Urban Decay has lost its Cruelty-Free certified status because of its decision to sell on the Chinese market. So whatever Urban Decay's intentions may be by launching in China, it could be at the expense of its brand credentials and its existing loyal consumers worldwide. 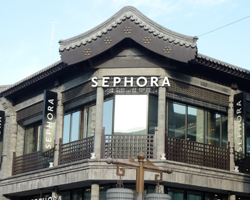 What do you think of Urban Decay's decision to enter the Chinese beauty market? Sadly noted. UD must not betray its values but I fear they have already done... Do you know if UD is to be purchased by l'Oréal ? Thanks. Thanks for your comment! I haven't heard anything about Urban Decay being bought by L'Oreal though. Yes I agree with Rebecca. This is a great way to find out all the beauty news! I've worked in beauty since 2004 and it's a great place to be. With a background in journalism I went on to set up my own beauty social media and copywriting consultancy. I am lucky to liaise with inspirational people every day. I give a lot of advice and I get given a lot of advice, so I thought; why not share this? If this blog can inspire any of you in your career like many people in the beauty world have inspired me in mine, then I'll consider it a job well done.